Atletico Madrid superstar Antoine Griezmann was likened to Lionel Messi after he scored a wonderful free-kick for Atleti against Sevilla this afternoon. Right on the stroke of halftime Griezmann produced a brilliant moment of individual magic to get Diego Simeone’s man back into the side. Atleti were dominated by Sevilla through the entire first-half of action and just when it looked as though the side would be doomed Griezmann came to the rescue. The Frenchman beautifully struck a free-kick from the edge of the box, that flew into the top corner. 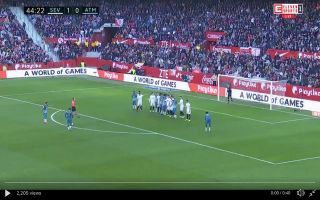 Sevilla put their best efforts into denying Griezmann the chance to score by placing two defenders deep into their box to attempt to block the free-kick. The fact that Griezmann’s strike flew over the wall, evaded the head of two defenders and left the goalkeeper rooted to his spot – says it all about just how magnificent the strike was. A little bit of Griezmann magic means Atletico Madrid are level at the break against Sevilla! ? Griezmann just did a Messi. Which is the highest praise there is. Sweet freekick by Griezmann. Made that look too easily. Atlético equalize. Through quality? No. Through individual reliance, as usual. A Griezmann FK.